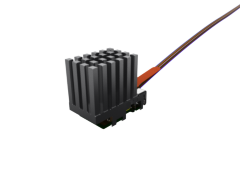 This FireFly™ optical Flyover™ assembly is designed for flexibility and is interchangeable with the FireFly™ copper assembly using the same micro connector system. It is available as a 12-channel optical transmitter or receiver to achieve 16 Gbps per channel, and a 4-channel full duplex optical transceiver to achieve 28 Gbps per channel. Click here to see a full list of mates related to ECUO. We're having trouble loading our ECUO Models. Please refresh the page to try again. If you continue to experience issues please contact ehelpdesk@samtec.com for assistance. We're having trouble loading our ECUO SI Performance data. Please refresh the page to try again. If you continue to experience issues please contact ehelpdesk@samtec.com for assistance. We're having trouble loading our ECUO SIBoard. Please refresh the page to try again. If you continue to experience issues please contact ehelpdesk@samtec.com for assistance. We're having trouble loading our ECUO Protocols. Please refresh the page to try again. If you continue to experience issues please contact ehelpdesk@samtec.com for assistance. We're having trouble loading our ECUO Catalog Pages. Please refresh the page to try again. If you continue to experience issues please contact ehelpdesk@samtec.com for assistance. We're having trouble loading our ECUO Prints & Footprints. Please refresh the page to try again. If you continue to experience issues please contact ehelpdesk@samtec.com for assistance. We're having trouble loading our ECUO Series & Mates. Please refresh the page to try again. If you continue to experience issues please contact ehelpdesk@samtec.com for assistance. We're having trouble loading our ECUO Test Reports. Please refresh the page to try again. If you continue to experience issues please contact ehelpdesk@samtec.com for assistance. We're having trouble loading our ECUO Technical Library. Please refresh the page to try again. If you continue to experience issues please contact ehelpdesk@samtec.com for assistance. We're having trouble loading our ECUO Compliance & Quality. Please refresh the page to try again. If you continue to experience issues please contact ehelpdesk@samtec.com for assistance. We're having trouble loading our ECUO Product Tools. Please refresh the page to try again. If you continue to experience issues please contact ehelpdesk@samtec.com for assistance.